Happy Valentine’s Day! I just saw a male student walking to class with a cluster of big shiny balloons. Was he a giver or receiver? Thanks again to Alyson Vaaler for writing her review of USASBE 2018. It’s important to support librarians taking their skills and knowledge to business conferences, educating faculty and promoting the value of business librarians. We can’t just preach to the choir at library conferences. USASBE will be in St. Pete Beach early next year, GCEC in Chicago in October. Ilana Stonebraker, fearless business librarian at Purdue, has started a blog on “Teaching on Purpose” and other issues: http://ilanastonebraker.com/. Recommended. A number of interesting posts on teaching strategies, including some active learning lesson plans. CABAL and BLINC are working on a joint one-day workshop in Richmond, VA this summer, probably a Friday in July. It’s still in the early planning stages, but the event will probably focus on both sources and services (including business research instruction), with dinner and partying afterwards. We will promote the event on BUSLIB in case you aren’t a member of one of those groups but would be interested in making the trip. Thank you to Howard University’s Tommy Waters, CABAL chair, for the suggestion that we do something together! Professor Nick Williamson and I have finished writing our Export Odyssey e-textbook. Publisher Kendall Hunt is editing and processing the book. This is my first book, so hooray! Hopefully some classes will use it and help some local SME manufacturers make their first export sales. Four months ago, I posted on the creation of our Liaison Team Structure Review Task Force. That structure is around five years old. We need to periodically review how well it is serving our needs, and indeed, there are some significant issues with our liaison work that need attention. Part 3: recommendations for changes (by final exams week). Back in 2012-14, I posted many times on the work and ideas of our liaison reorganization task force (tagged with “liaison organization”), largely wrapping up that thread with our 2015 ACRL program with Johns Hopkins and Villanova. But as part of the current task force, I wrote a two page summary last week of what motivated us to pursue liaison reorganization back then and what the results were. Here is that summary. Define the collection development, instruction, outreach, and newly defined and enhanced responsibilities of our liaisons. Define the ways that collection development has changed over the years. Benchmark with other libraries to see how they are handling the complexities of liaison responsibilities in new, creative and innovative ways. Recommend an organizational model for collection development and other liaison responsibilities that will allow us to give the proper attention to both areas in a sleek and efficient way. More than one organizational model should be recommended providing alternatives to choose from. 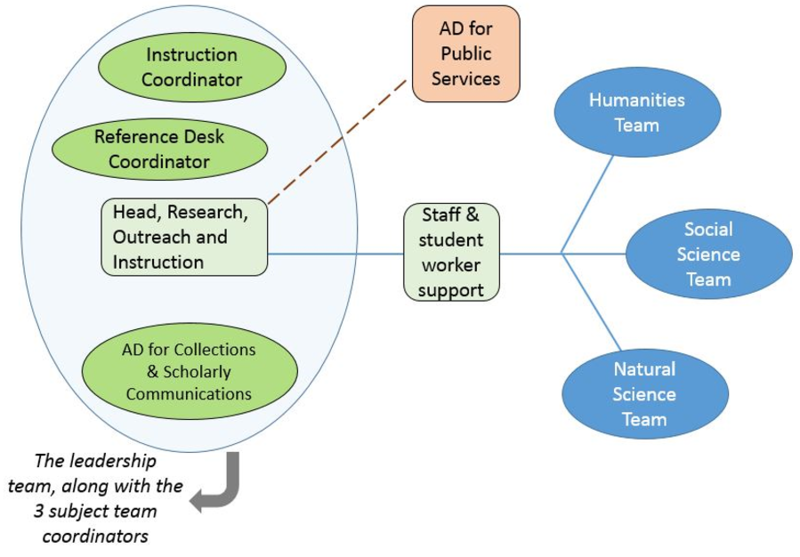 While collections work dominates that charge, many liaisons had also grown frustrated with the increasing disconnect between evolving liaison roles (for example, an emphasis on proactive engagement with teaching and research support) and the lack of opportunities for discussion and training regarding those roles. Most meetings of the Reference & Instructional Services department continued to focus on collections work and reference desk staffing and policies. These issues were also considered by the task force. A July 2012 retreat of the Administrative Advisory Group modified the goals of our liaison program: liaisons would spend much less time providing collection development and reference services, while focusing more on providing proactive support of research across campus. The task force was asked to incorporate these revised liaison goals into its work, expanding the scope of its final recommendations. At this time, liaisons were based in a number of UL departments (including Music, missing from the below graphic). Liaisons met via the large Collection Management Committee. There was no central liaison coordinator. 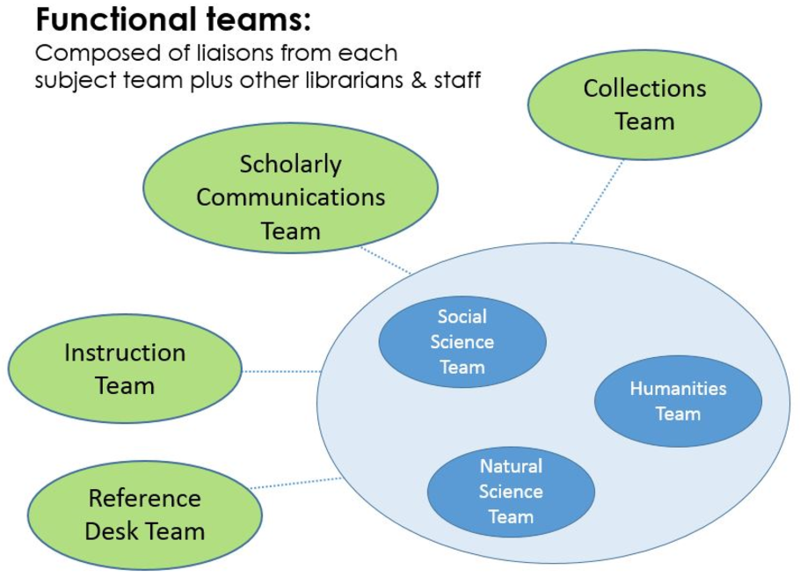 Some liaisons had other full-time roles in the UL; their liaison role was primarily handling collections questions from their academic departments. Through the spring and summer of 2012, the task force organized many discussion and brainstorming sessions (including once with WFU liaisons), examined the (scant) literature on best practices in liaison organization and leadership, and interviewed liaison coordinators from the small number of libraries that had recently reorganized their liaisons away from the decentralized, collections-centered model. The task force then presented several new organization models to the liaisons and other stakeholders for final feedback. Finally, the task force submitted its report to the Dean in August 2012. The Liaison Implementation Team created a two-year timeline (2013-14) to implement these subject and functional teams. As part of the process, members of the Special Collections and University Archives and the Digital Media Commons become team members. The Reference and Instructional Services department was rebranded as Research, Outreach, and Instruction [long overdue]. The ROI department head become our liaison coordinator, who oversaw the teams and organized monthly all-liaison discussions. Some liaisons whose main role was collections work retired their liaison roles. The UL created a Science Librarian position for the first time; that liaison joined our existing Health Sciences Librarian and a SCUA member to form the Science Team. Liaisons rewrote the UL’s official description of liaison roles. Teams began providing peer-training (often inviting other teams to participate). In general, meetings seemed more useful and more interesting to liaisons. However, communication across teams and through the UL proved challenging. While collections work is now much less demanding on liaisons’ time, liaisons still struggle with workload issues. UNCG expanded student enrollment and the number of faculty dramatically in the 21st century. Some liaisons have experienced a large growth in their target population (one liaison is now responsible for over 4,000 students). A new liaison position to serve the School of Education was created in 1998, but was later redefined with a non-liaison focus. The creation of the dedicated Science Librarian position in 2014 restored the UL to the 1998 level of liaison staffing. In Fall 2017, the Liaison Team Structure Review Task Force was formed to examine and reassess the 2013-14 changes and their intended outcomes. Those last two organizational charts were illustrative examples. We never really had a scholarly communications team, for example. (We may get one eventually: we are hiring our first dedicated ScholCom officer next year, apparently.) But overall those images do reflect what we ended up with by 2015.